Kévin G. & Fanny R.
It is while discussing with Isabelle P., whom I had made an appointment with at Le Goût des Autres (The Taste of Others) for another article of this series, that I made acquaintance with Fanny and Kévin. It was the Monday after Halloween. Isabelle and I were talking about the Haunted Alley, a neighborhood Halloween collective project. Fanny, who had gone through that alley with her preschool-age kids, spontaneously joined the conversation. As young parents, she and Kévin – who arrived later after errands and deliveries for the business - had much to share with Isabelle and real affinities. 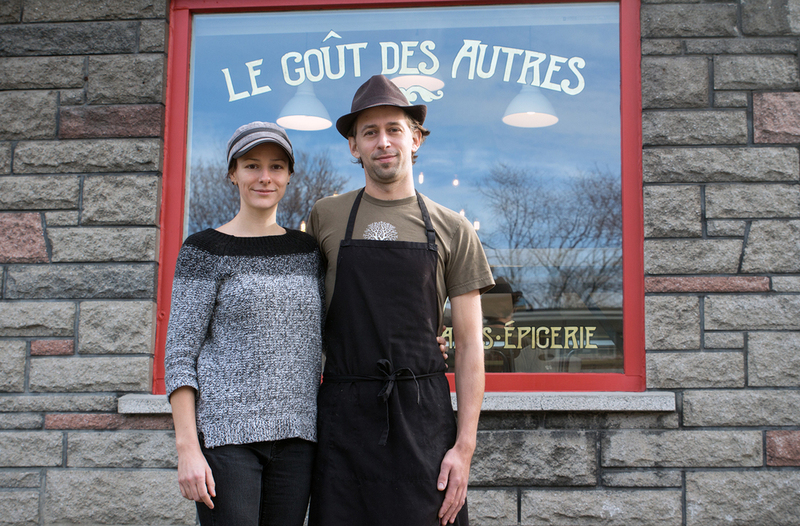 Kévin and Fanny are the owners of Le Goût des Autres. They offer online catering services and operate a take-out shop on Sauvé Street, just east of the Metro station. The shop is also a tasting bar with tables for a dozen people. You can order the daily dishes to enjoy on the premises or at home. As they both worked in the restaurant business, an area where people are very mobile, it is naturally in a restaurant, the Bistro L’Enchanteur in Villeray, that they met. Although still young, they both have good experience in cooking and nutrition. Kévin is a native of Bourges, France. After graduating, he perfected his restaurant training in fine establishments in France, London and Edinburgh, a city that deserves to be better known. It was in that city that he met a Quebecer with whom he came to settle here. In Montreal, he worked his way around, from the kitchen of classy restaurants to neighborhood bistros. He thus gained a good knowledge of Quebec recipes and local ingredients. His last job, while Fanny was pregnant with their first child, was at Milano, an Italian deli on St. Laurent Boulevard near the Jean-Talon Market. There he cooked prepared meals to take out. Fanny for her part was born in St-Philippe-de-La Prairie, an area where vegetable crops are produced on a wide scale. She worked in a market in La Prairie, in a grocery store and studied nutrition in CEGEP for a while. She later turned to the restaurant trade. They both have lived in Ahunstic for the past ten years. It is with the help of the CDEC and program named SAJE (a French acronym for Support to young entrepreneurs) that they are started their business. Le Goût des Autres was first operated from sublet kitchen facilities, reaching people by relying on their contacts, advertising, the Internet and word of mouth. Both of sociable and friendly nature, they appreciate having direct contact with their customers, something that could be difficult to establish in jobs that would tie them up in the kitchen. It’s while talking with a client that they learned that their current premises, which already housed a catering business, was available. They are at their current address since 2014 and have already made renovations that show the expression of their personality. That Monday, the vegetarian chili simmering smelled delightful. When I returned the next week, at a time when they could breathe a little, I took home a portion of a fine grilled vegetable terrine. The couple offers a menu for all tastes, which also includes dishes that are suitable for vegetarians. Kevin makes sure that the menu offers both quality and variety. He mentioned that a well written infomercial was put online by the Yellow Pages. You will find a link at the end of the article if you want to know more about their offer. While we were chatting, I mentioned that my wife has been cultivating a diversified vegetable garden for several years. Fanny then told me that she would like to transform the irregular lot of unused land between the street and the neighboring property into a collective garden for people in the neighborhood. As this space is owned by the city, this could be an interesting pilot project. Since they already buy produce for the preparation of their dishes, she is also considering the possibility of adding fresh vegetables to the current offer of their shop. Now residents in the vicinity, they display strong will and lots of energy to develop their business while raising young children. I wish them great success: the neighborhood needs people like them!